We've still been continuing with circle time (morning gathering) every morning. It has become a lovely part of the day. We are all together, reading, singing, drawing. I've been incorporating a game each week into our circle time as well. Not something that we will be sitting there for hours playing (I try to keep circle time to about 1 hour). 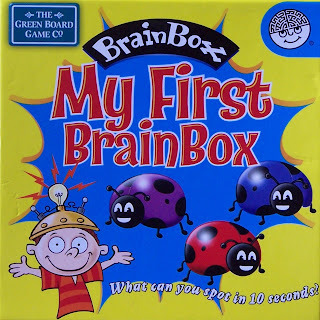 This week it was My First Brain Box. I hope to post my review on this game later in the week but in a nutshell, we love this game. It's quick, simple, only a few pieces and comes together really very quickly. I'm also trying to include poetry reading each day in the circle time. We are currently reading from this collection. 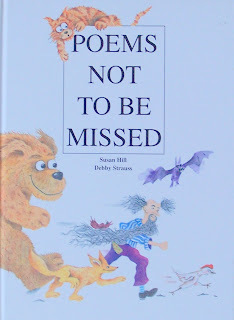 It includes poetry by Lewis Carroll, Spike Milligan, William Shakespere, Robert Stevenson, to name a few. This week we had a gorgeous morning at a little creek nearby our home. We are very lucky to live so close to the beach, the bush and rainforests as well. The kids always have plenty of outdoor play at home, riding bikes, scooters, jumping on the trampoline, playing on the swingset, digging in the dirt and just plain old running around. We always go through a huge stack of books each week with Tot School but there always seems to be a favourite or two. 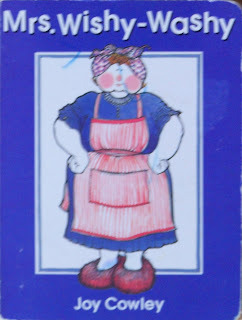 This week it was definitely Mrs Wishy Washy, this is a great little story and C is the perfect age. He says all of the animal names, makes their noises, washes himself and rolls around when they roll in the mud....all very hilarious really! I can't quite figure out if C actually likes this Imbucare Peg Box or not. He never chooses it but when I get it down he will normally place 2 - 3 of the pegs in the slots and then hands the rest to me to finish off. He is really starting to understand the concept of 'big' and has even said that a few things were big this week, a crane we saw this morning and then a big truck drove past when we were at the creek and his little arms instantly went into the big pose. How cute is that! I quickly made up some truck size sequencing pictures this week for him and have only shown him 2 so far, big and little. **Note to self, do not create tot school activities whilst said tot is with you. 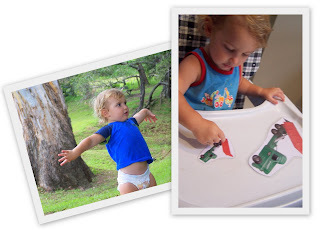 He so loves trucks he had to watch them all print out, then I cut them up, glued them on card, cut them up again, ran them through the laminator and cut them again all before he could get his hands on them. It was torture for a 19 month old I tell you, just plain torture! This little activity house doesn't come out that often, but I pulled it down this week. He loves it. 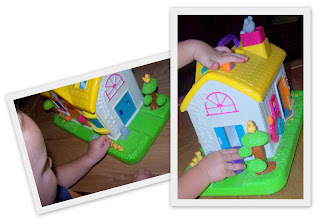 It is a noisy toy, but not over the top and most of the noises are fairly close to genuine animal sounds. The bird pushes down and cheeps, the ducks move and quack, a dog barks, the doorbell rings, the windows open with things inside them. But his favourite part of the house is the garage, push the button, the doors open, the car starts and out it comes (well the sound of a car starting anyway). 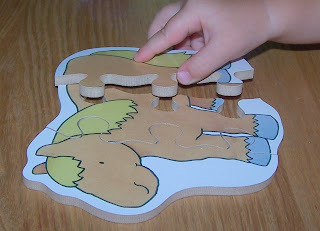 We are still continuing to work on his shape puzzle every week. He's just about it got fitting the pieces down pat. I thought I'd show him this little 3 piece puzzle. Obviously at first he had no idea, but once I placed one side he knew exactly where the other piece went, it was just a bit tricky for him to get in. He is probably a little young for this one yet. Oh what fun a few giant pieces of paper can be. 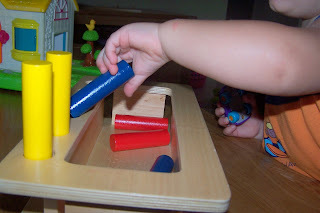 First K laid these on the floor so C could walk back and forth over them, which he loved doing. 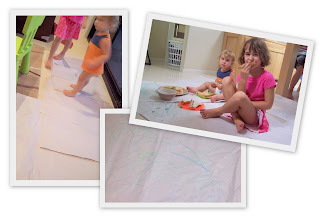 Then they became a scribble sheet, which eventually turned into grass, where they both had a picnic lunch on .....all with a few sheets of paper and some green crayons. This is the first time C has done any purposeful spooning work. He's pretty good with a spoon and has been feeding himself since before he was 1. I went out today and grabbed some popping corn though, as these pasta pieces were just far too big. C was interested in the Knobbed Cylinders this week so we sat down and gave it a go, he is getting half finished before he's had enough of this work. There's always talk about what to do with a toddler when you tyring to school older children. Thankfully C is a pretty independent little guy and can make his own fun. 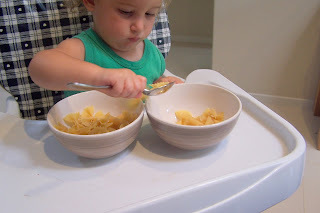 I try not to schedule to many 'Tot School' things during big school time as I need to be available for B and C. Tot School gets done either before or after. So I always try to have easy access activities for him. These change depending on my mood, but they all need to be able to be pulled together in about 5 minutes and packed away in roughly the same amount of time, otherwise the effort would just become to much. 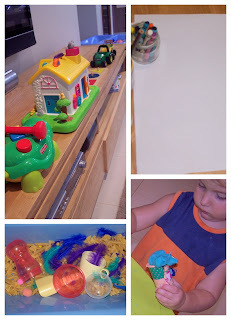 This particular morning I had random activities(toys) on the low shelf for him to choose, drawing with crayons, on the coffee table, his sensory tub and playdough on his table. He spends his time going around the room from activity to activity. 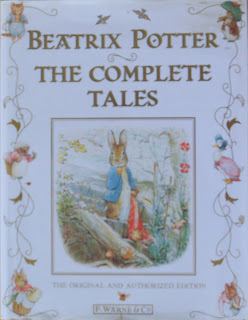 Our current read aloud is the Complete Beatrix Potter Collection. We've read several of the stories in here before but we thought we would go from beginning to end this time around. K loves Peter Rabbit and has the full collection on Cd as well which she listens to at night at least a couple a times a month. We had a Letter A focus this week. This was not how I plan to do sound work, but I am waiting on some miniatures to arrive so I can complete my sound boxes and introduce them properly to K. However I figured it was better we did something, rather than nothing. 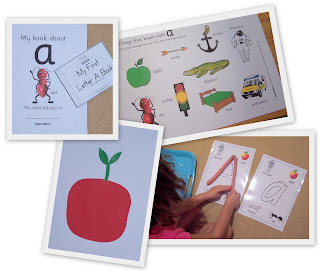 Sparkle Box has several really good, very colourful down loads, including the activity sheet and book about letter a. She loves the playdough mats so I need to get to work and finish those off. I gave her some pre cut paper piecing items (that I just cut out free hand), which were to become 'Ants on an Apple'. She kept telling me that the ants were not ants they were seeds, even when I showed her how to draw legs to make them look like ants she didn't want a piece of it. So it is just an apple, no ants on that apple today LOL! At this stage K appears to be struggling somewhat with her sounds. I'm not sure if it is because she really isn't interested (I hope her new sound boxes will help with that, when they are done) or if there is a problem. So we will be off for a hearing test in the coming easter holidays. 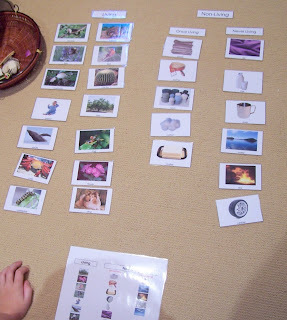 In the meantime we've been playing lots of I Spy (using Montessori 3 Period lessons) and Simon Says but where she needs to carry out 3 - 4 tasks, so for example Simon Says, jump 3 times, turn around and wave with your right hand. She has to do them in the order that I said them in. From her reaction to this game in particular I think I just need to find some more fun ways to introduce her letter sounds. Ideas anyone??? 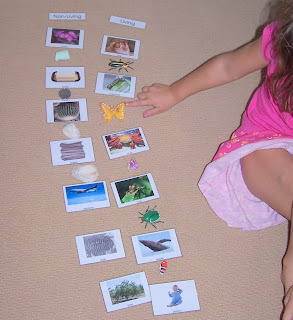 She also begun work in a handwriting book and we used the OPGTTR every day for the letter A chant. This week she completed Book 1B in her Earlybird Singapore Maths, she's powering through that work. The last few pages focused on basic shapes and colours. She also started on the next in the series, 2A. 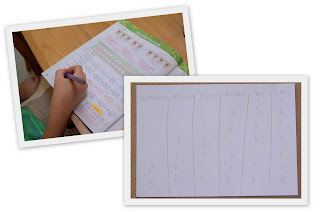 The first few pages a recap on number recognition and number writing practice. 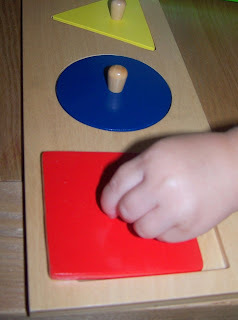 I wish she would use her sand tray and sandpaper numbers because she really needs help with her 2's and 3's but it will come. I dug out this little numbers to 10 sticker book, thinking that the 'fun' element may entice her to at least try and do a 3 how they are supposed to be. It certainly worked for the ones', hers look identical (nearly) to the ones in the book, even with the little hook thing at the top. Let's see how she goes with the 2's. She chose the living/non living sort again this week and pretty much has that down pat now. We also had loads of bubble fun during the week and our visit to the creek. This week's Art lesson was on drawing faces. 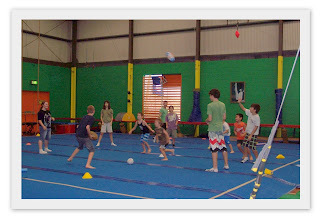 In the 4 - 6 age group the main focus was to make sure everyone knew the placement of the features. Although this was nothing new to her she did come away with a few pointers, like Miss Liz showing her to outline her face with black or a dark colour so that it really stands out. She loved this class though and you can see her giggling there with her little friend T.
They also spent some time just drawing different, eyes, noses, ears etc. Then they had to draw an 'ugly', which was just a weird made up creature and then a person's face, using everything they had learnt in the class. 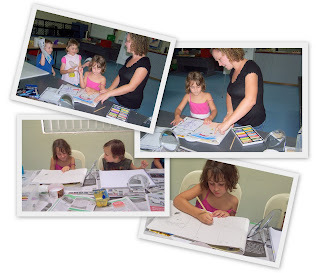 She made some pretty cool bubble prints and enjoyed the shape game. 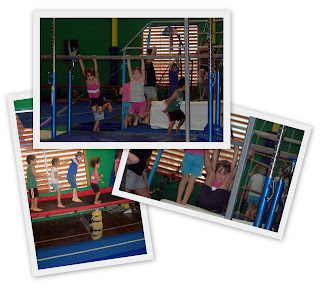 Gymnastics has become a favourite and much anticipated activity for the week. 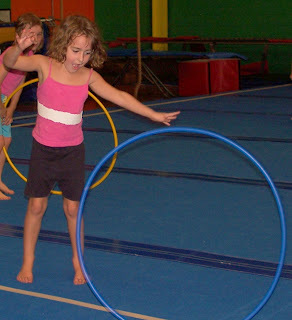 She is getting really good with the hoops and practices at home several times a week. She's always been a little monkey so it is no surpise that she can get herself onto the bars and the super duper long tramp is always heaps of fun. Current Read Aloud - we are still working thorugh George's Secret Key To The Universe. It is taking longer than normal as B is keeping a journal for each chapter, so I can't always just keep on reading, we need to wait until he has caught up. That's completely fine, with practice it will all fall into place. 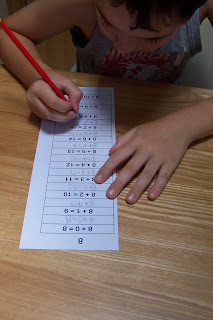 He actually chose the moveable alphabet to work with this week, I was ecstatic! I bit my tongue though with his word building as I know all of these are super easy for him, but he was doing it and that's what counts. Another week of ETC and Fitzroy, with last year being a little slow we are slightly behind where he probably should be. I'm not concerned though, he is taking his time with his reading, he really isn't a risk taker and needs to feel comfortable before forging ahead. This week he finished ETC Book 2, Lesson 3 and Fitzroy Book 2, Reader #14. Now that we are well into the year and he is in the routine and doing well, we are increasing the number of books he is required to read in a day and we are also adding in alot more sight words this week as well. Hopefully this will give him the extra boost he needs right now. He is doing well with his Book Journal, sometimes I struggle to get anything out of him but other times it rolls off his tongue. Finally finished his Grade 2 maths book and made a start on Grade 3. 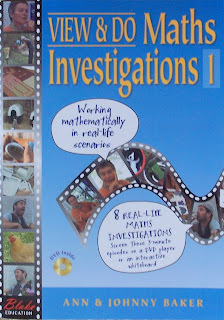 The more we use this 'school' type maths program the more I really don't like it. We are going back to Math U See as our core (half way through Alpha) and using Targeting Maths as a supplemental. 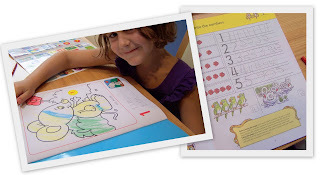 I so would love to have the confidence to throw it all out and take the approach Kendra does with her Living Math Lessons and I am going to try and do at least one fun/living math lesson a week. They are so much more meaningful that way. We did have a fabulous, totally impromptu lesson on the decimal system up to 100 Thousands. I can't remember how this came up but it was all completely from B. Please excuse the handwriting, I was feeding C and writing upside down doing this so B could see it easily and I do think I got a couple of my numbers backwards!! We have been doing a small amount of addition facts copywork. I keep reading how happy others are using this system. He pretty much knows all of these facts, I would just like his recall to be a little quicker before we move ahead. He spent some quiet time working with Brainy Blocks. We had all of that bubble fun this week and our time spent at the creek. He also worked on living/non living but with the extension of once living and never living. A couple were a little tricky but he enjoyed this and it opens the door for many discussions. B's class had the same drawing lesson as K's, just for the older kids. 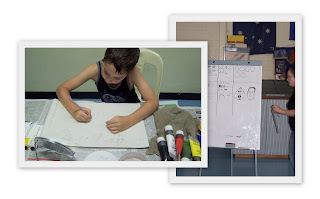 He spent so much time drawing different facial features that he didn't get an actual 'face' completed, but he has been doodling with faces all week since, trying out different combinations. Whilst he did do a couple of bubble prints this week he really didn't enjoy the activity at all. 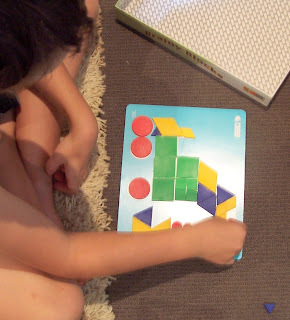 He did however love the Shape Game and I am sure this will become a regular for us. Mixed Sports is still his number one pick, although he enjoys Gym. Soccer starts back soon so we'll see then what his number one is. 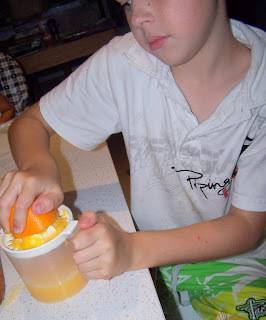 One afternoon this week he decided he wanted some fresh OJ, he went about it completely on his own...YAY!!! I can't keep K out of the kitchen (not that I want to) and I generally can't get B in it, so this was lovely to see. Well that about wraps up our week. 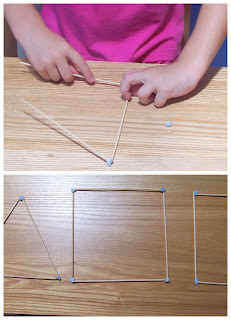 I am linking to 1+1+1=1 for Tot School and Homeschool Creations for Preschool Corner. Sounds like a great week Kylie! I must pick your brain about where (in aussie? import?) 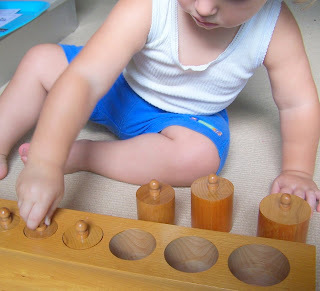 you get some of your cool montessori materials. Next year Q would technically be prep age, and I don't plan to do anything 'formal' with him.. but I thought some self directed activity ala monti might work well. Emailing you re: art tomorrow! What a wonderful week all three of your kids had! I love how you have toys out for your youngest while your doing school with your older two. 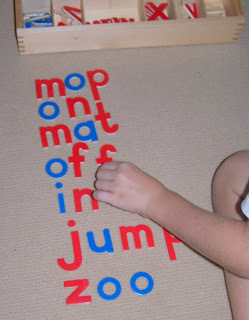 Loving those playdough alphabet mats ~ where did you get them?